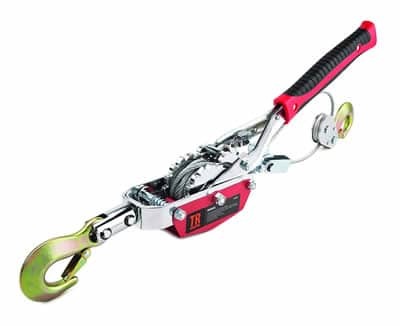 Sometimes known as the hand or come-a-long winch, the cable puller winch is an extremely versatile tool if you ever need to lift or pull heavy objects, or tighten straps and heavy loads. Cable puller winches really are great all rounders and can get you out of a fix, easily and efficiently, with minimal effort on your part. Wether you need to load a heavy object, like a moose or buck, on to a trailer, get your truck or car out of the mud, secure a load, or winch a partition wall up ready for fixing, the come along winch is ready to get the job done. A lot of tools are good for a specific job, such as a Bendpak 2 post car lift for example, but the cable puller winch is perfect for such a wide variety of jobs. And because it is both portable and cheap, you can keep one in the truck in for when you need it, and have one in the garage or workshop for everyday use. We tested each of the cable puller winches against build quality, price, pulling length and capacity to determine the top 3 winches that you need to consider. This article will detail each of these three winches and explain how their differences are relevant for different types of tasks and which one is best for your requirements. Below is a comparison chart which quickly summarizes our choices. What type of work do you want the winch to do? How durable and weather resistant is the winch? How safe is the winch? How fast do you need to pull things? Is the winch comfortable for you to use? The first winch on the list is made by TR Industrial. This company are experts in crafting high-quality hand tools and boast one of the most complete lines of various accessories and tools. The main features of this Winch are that it comes included with two hooks that can be used as a single line or double line. This highlights the flexibility offered by the TR Industrial. The puller boasts the kind of power and precision that is required to take on even the most ardent construction-related tasks. The dual gear pulling mechanism generates a maximum capacity of 8000 pounds which makes it more than capable of handling tough landscaping and farm-related projects with a safe working load of 2 tons. The pulling capacity of the TR Industrial is double that of the 2nd choice winch in this review, so you will be able to perform more jobs, safely and efficiently. The 18″ long leverage handle comes with a comfort grip that covers more than half of the handle, allowing you more space to comfortably apply force and pull the load more easily. 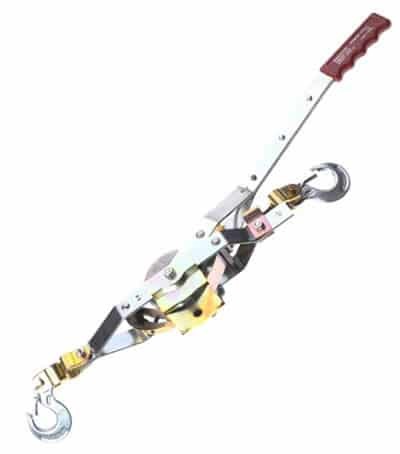 The 1/4″ braided steel cable which is aircraft grade, and drop forged hooks with safety latches provide peace of mind that this cable puller is going to do the job for you for years to come. More Details84% of buyers on Amazon rated the TR Industrial portable 4 ton dual gear cable puller as 4 or 5 stars with many customers noting the robust construction, and were more than happy with its performance. The only downside I can see to this come-a-long hand winch is the short cable at just 4 foot 8 inches. However, you can always attach a strap, cable or rope to this to provide additional length if required. This is a perfect cabler puller winch for those who need a reliable and powerful winch for complex and large tasks. The second cable puller winch on this list is USA built. 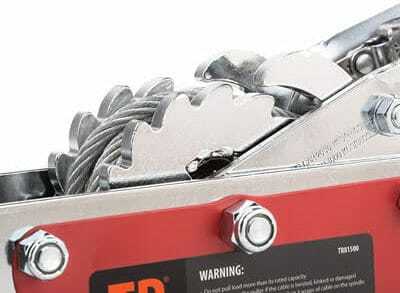 The standout feature of this winch is its ease of use and durability. It is also priced lower than many similar cable pullers which makes it excellent value for money. Most customers have been impressed by how simple it is to use for a multitude of tasks. Even novice users can perform a wide range of tasks using this puller. A bonus is the non-slip plastic grip which makes prolonged use fairly comfortable and prevents the type of fatigue that can occur with other winches which have poor grip support. The 12 foot maximum pulling length is fairly sizable for a number of different tasks, which makes the winch more than capable of handling light to heavy loads. More DetailsThis really is a well respected and loved cable puller, with 89% of buyers on Amazon rating this tool as 5 or 4 stars, which is simply excellent from such a large number of reviews. With comments like “Save yourself some money and aggravation and by this brand.” and “Simple, strong, useful!”, it really is easy to understand why this is our top choice. The high-quality construction means that the winch remains effective even after long term use. It is clear that the USA based build quality has played a role in the robust construction of this product. This is a cable puller that is designed to handle a range of tasks and remain usable for a number of years and one I am happy to use in my workshop. The final cable puller winch on our list is one designed for heavy duty and demanding tasks. The 2 Ton capacity makes it more than capable for even the most ardent of tasks. The braided steel construction is of the highest quality and designed to last even after working in the toughest conditions and the inclusion of two hooks allows for flexibility in most tasks. The comfortable non-slip grip means that time-consuming tasks can be done without causing fatigue which allows them to be completed more efficiently. Many customers have noted the high performance of this cable puller winch. It can be a little more difficult to operate than the two winches we listed above; however it makes up for this with its well-constructed ratchet wheels and pawls which are made from stacked plates of steel. This heavy-duty construction is reflected in the high-quality performance. More DetailsWe highly recommend this winch for those who are more experienced and require a reliable powerhouse that can effectively complete a number of demanding tasks. Hand winches are relatively simple machines, yet they are some of the most powerful tools that you can have in your arsenal. While come-along-winches aren’t expensive, finding the right one is important, because it has to perform when you need it. Whether you’re off-roading or spending a day out on a sea or lake, having a winch that works for you can be the difference between a successful weekend and a miserable one. Here are a few things that you need to look at before you buy your next tirfor winch. First, before you even start looking at hand winches you have to ask yourself what type of work that you want the winch to do. Griphoists work well to both lift and pull objects, but usually are only designed to do one job really well. Most can work well in a pinch, but if you’re working construction and the job is going to rely on lifting up some scaffolding you don’t want to be relying on a winch built for performance off roading, even if it is top of the line. 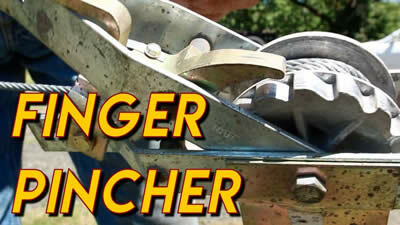 Find a winch that is going to work well for the job you want it to do. On top of this, not every type of winch is able to move the same amount of weight. As a rule of thumb, you should look for a winch that has a maximum pulling capacity at least one and a half times the total amount of weight that you think you’re going to need to end up pulling. This way, you can save some money if you don’t need a winch rated for several tons, but also will have the power and security you need when you need it. Finally, try to estimate how far you will need to pull objects. Will you only need to pull them a few feet or will you need to pull them 100 or more? Make sure to find a winch that has enough room on the spool to fit the amount of cable that you will need. Odds are, you won’t be using your winch in the best of conditions. It is going to have to perform at its best in rain, muck, ice, and snow if it’s going to be there when you need it. Because of this, you need to make sure that your winch can withstand these conditions. The entire winch should be coated with zinc or enamel to prevent the metal weakening from corrosion and rust. Also make sure that the brakes that hold the line in place are securely enclosed in a box that will prevent them from becoming covered in mud or water, which would severely impair their ability to move loads securely. Most Tirfor winches today will come equipped to stand up to harsh conditions, but some cheaper models may not be ruggedized and may leave you high and dry when you need them, or worse injure bystanders when they fail. Along with how durable a winch is, how safe it is will also determine how successfully you can use it to move objects. Generally, it’s a good idea to go with the safest rated winch that you can afford, especially if you’re moving heavy objects like cars. While you might not end up needing it to be incredibly safe, you won’t be risking the safety of your and other bystanders or the destruction of whatever you happen to be lifting or pulling. Gear ratios are another important detail to look at when buying a griphoist. For lighter loads, you can use a small ratio, but for heavier loads make sure you and an appropriately larger gear ratio. If speed is of the essence, an electronic winch may be a better option than a hand winch, especially if you are off-roading. With an electronic winch, you merely need to anchor the cable to a secure object and press a button and the winch’s motor will do the rest, pulling you out in a few minutes. While also effective, winches powered by human strength will take much longer to achieve the same result. However, there are a few circumstances were an electronic winch may not be enough. If you need to pull your vehicle in a direction other than immediately forward or if the battery that powers the winch dies you will need something other than the electronic winch on your bull bar. Look for hand powered winches that are built specifically for performance and to haul loads in quickly and safely. Finally, don’t forget about how comfortable the winch is for you to use. You can find the most high-end winch in the world, but if it doesn’t fit your hands you will be miserable using it at best, and at worst not be able to haul any loads in. 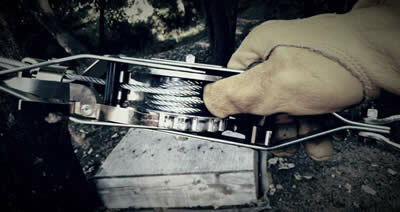 When you’re looking for winches, make sure that the handle fits your hand and that it doesn’t feel flimsy. Try it out in the store a little bit and make sure that you will be able to deliver the right amount of power to the winch. Taking some time to find the right hand powered winch might seem a little frivolous because they are relatively inexpensive tools compared to some other instruments that you may use. However, when its time to use a winch, you often are out of other options. If the winch doesn’t work, you might end up walking home or not getting your boat up to the dock. Make sure that you don’t get stuck and find the right winch for you that will work for years to come. If you are wondering how to use a come-along-winch safely, take a look at this great video where a fireman walks us through the different parts of the winch and how to operate it safely. Hopefully, you will now have a better understanding of why these three Winches are amongst the best. It is important to have an idea of the types of projects and the tasks the winches will be purchased for before making a final decision. Your budget and performance requirement will ultimately be the most important indicators for choosing which type of cable puller winch you go with.